Satellite imagery has discovered Carolina rivers so polluted their streams appear dark from outer space. These streams, unfortunately, are not only polluting and damaging water quality throughout the Carolina’s but also pouring into the ocean. A NASA satellite is tracking flooding in the Carolinas following Hurricane Florence, and its images show dark, polluted water flowing from rivers into the Atlantic Ocean. That rain led to catastrophic flooding across the state, and has polluted rivers, streams, creeks and their outflows along the coast, NASA’s satellite images show. 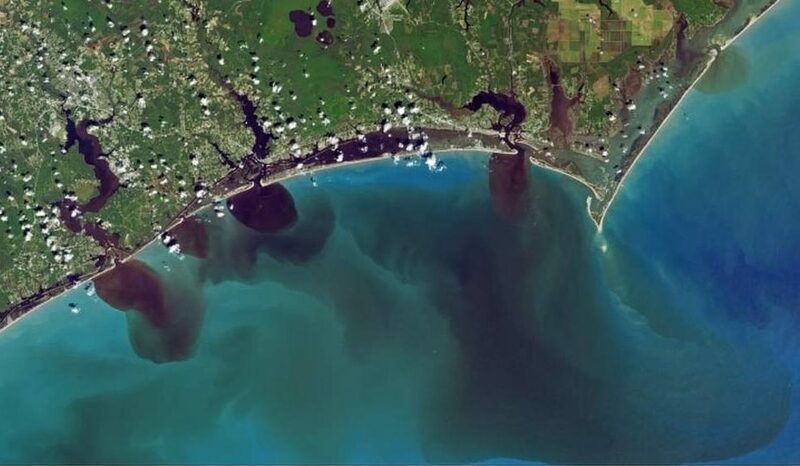 One image captured on Sept. 19 shows the New River, White Oak River and Adams Creek south of Cape Lookout and the deeply discolored water that appears dark brown — or even black. But that isn’t the only material floating in North and South Carolina’s rivers. Floodwaters from Hurricane Florence were also responsible for the deaths of 3.4 million chickens and thousands of pigs in the state’s notorious factory farm system. While many Americans were horrified to see that these animals were left to suffer and drown, an admittedly horrible and inhumane fate, the issue of factory farming in general was ignored, i.e. the reason why millions of chickens and thousands of pigs were housed in giant factories to begin with. Nevertheless, the floodwaters rose and with them, incredible amounts of pollution not only from the dead animals but also from the factory farm waste of chemicals and excrement these operations produce en masse. All of this water, of course, is traveling down the rivers of the Carolina’s, destroying wildlife and the environment, only to end up in the oceans already suffering from massive continuous die-offs of virtually every type of living creature residing there. 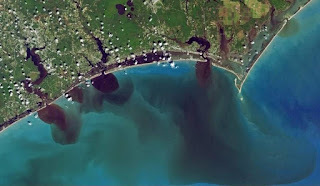 While big corporations may not be responsible for the hurricane and its damage, they are often responsible for the toxic soup that is left in the aftermath as both North and South Carolina, as well as the ocean off the Carolina coast is finding out yet again. This article (NASA Space Images Show Dark Polluted Water Spilling From Carolina Rivers Into Ocean) was created by and appeared first at Natural Blaze. It can be reshared with attribution but MUST include link to homepage, bio, intact links and this message.